Life, Laughter and Paris: It's That Time! Meet Me On Monday! It's That Time! 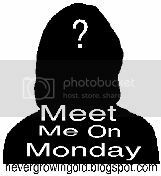 Meet Me On Monday! Here it is Monday again! How did that happen? Wasn't it just November? Time is moving a lot faster than I am! Well, hello to all my Monday pals! Let me think. No, I'd probably remember that. No blue ribbons hanging on my wall. No trophies on my mantle. Actually, no mantle. I would like to win first place in the lottery. Almost never. The only time I paint my toes is if I'm wearing sandals to an event where people will be facing the floor. ﻿﻿ ﻿﻿3. What color eyes do you have? ﻿ 4. Look to your left....what do you see? My shoulder. Same if I look right. Soft. That way no one can hear when I'm gobbling them down! Wishing you all a happy week! I'm now following you and would love it if you follow me back if you haven’t done so already!! Hope you have a great week and thanks for participating!! Great answers! I loved your response to #4. Love your answers. I'm glad both eyes are green. My father has green eyes and I had always wished I had them, mine are brown. Nice to meet you and thanks for stopping over today.